To some people, football is a foreign film without subtitles. One of those people is Eric Gerets. For all the blinding achievements of his managerial CV, the simplicity of finding the equilibrium between an exposed defence and a superabundance of attacking players seemed to be a crippling problem for the Belgian during his time in charge of Morocco. His successor Rachid Taoussi not only tried to attain balance by dropping several attacking midfielders and going back to basics, but also brought effervescence that was contagious on Saturday as he patrolled the Marrakech touchline like the ebullient uncle cracking jokes at a family wedding. After a nervy opening 20 minutes, for an hour or so thereafter the Lions of the Atlas had imperious control of midfield as they pinned Mozambique inside their own half and pummelled them without respite; captain Houssine Kharja drove from midfield with malevolent intent; Abdelaziz Barrada showed Adel Taarabt how to play football without gewgaw; Oussama Assaidi’s half-time introduction added incision and end-product; the substitution of Younes Belhanda for Nordin Amrabat brought more impetuous into Moroccan forward line as they went in search of more goals; and Youssef El Arabi’s futsal dynamism sealed the aesthetics and added further variation in attack. Whilst questions remain about the state of the defence – goalkeeper Nadir Lamyaghri went out of his way to look calamitous on the very few occasions he was called upon and Zakaria Bergdich remains vulnerable defensively – the end result of a fusion of all those aforementioned attacking players was computer-quick football, which eventually broke down the Mozambique maisonette. It was the edge-of-your-seat football that would have implanted optimism into the heart of even the most cynical Moroccan; the type of football that is difficult to fathom the Lions of the Atlas would have ever been able to execute under the pragmatism of Gerets, but the type of football everyone knew they were capable of, and the type of football Morocco – dubbed the ‘Brazil of Africa’ in the 1970s and 1980s – have been synonymous with in the past. If Morocco had mobility in their side, then Cameroon had morbidity in theirs. Conceding an early goal certainly didn’t help matters – as it mean they had to score 4 unanswered goals – but the pedestrian, steady-Eddie passing, particularly by Alex Song and Jean Makoun in midfield, made Cape Verde’s caravan defending a lot easier. The (In)Domitable Lions quest to go for experience by including the likes of Pierre Webo and Mohammed Idrissou in attack backfired spectacularly. It was a stark contrast to the approach of the Moroccans, who had young legs, continual movement, probing passing and zest in their attacking juggernaut. There will be those who lament that Cameroon aren’t at Africa’s footballing summit, but they’ve embarrassed the continent for far too long. Years of mismanagement have caught up with them, as have ‘minnows’ like Cape Verde. A decade ago, Cape Verde, who prepared for the second leg in Sporting Lisbon’s football academy complex in Portugal, were ranked 182nd in the world. Qualification is a fantastic achievement for a country with a population of 500,000. 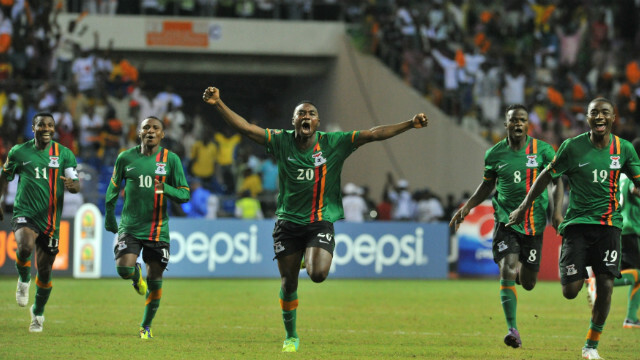 Elsewhere, African champions Zambia walked a tightrope as they were taken to spot-kicks in Kampala. Uganda, who haven’t lost at home since 2004, won the game 1-0. With the Jonathan Agnew score at 1-1, the ticket to the Cup of Nations was to be decided by penalties (there is no extra-time in these Cup of Nations qualifiers). When the ever-reliable Christopher Katongo, a man who we love dearly on SFG, missed his penalty it seemed the unthinkable could unthinkably happen: that we wouldn’t see those wonderfully choreographed goal celebrations; that we won’t see the reflections of our faces on Herve Renard’s serene white shirt; and, far more significantly, we won’t see Renard roaring “MAYUUUUUUUUUUUKA!” Uganda’s captain Andrew Mwesigwa missed his and then a marathon penalty shoot-out ensued, questions over the duration of the penalty kicks arose: would they last for eternity? The juju on both sides seemed pluperfect. After 19 penalties, Patrick Ochan was all at sea and missed his spot-kick, and Zambia advanced to South Africa 9-8 on penalties. The qualification of Zambia and DR Congo, who lost 2-1 away to Equatorial Guinea but won 5-2 on aggregate, means there is a potential clash between Claude Le Roy and his protégé Renard, who was previously assistant to Le Roy with Ghana. If either Ghana or Ivory Coast don’t make it into the final of the 2013 Cup of Nations, then I will quit football blogging. Ghana took a 2-0 lead to Malawi and, although they were far from their best, their ruthlessly efficient 1-0 win was what TV pundits would call the ‘Hallmark of Champions’. Isaac Vorsah’s thou-shall-not-pass stand at the heart of the Black Stars defence was Herculean, snuffing out every fire that the Malawian Flames could muster, his colleague John Boye, one of the last Cup of Nation’s impressive performers, was nearly as good. John Paintsil and Harrison Afful justified their places in the full-back positions, which have been quarrelsome, with solid performances. More significantly, Norwegian-born goalkeeper Adam Kwarasey, deemed by many to be the weakest link in the team, also had one of his best games in a Ghana shirt, showcasing aerial ability may no longer be a problem as he plucked the ball from the air in several uncertain situations, putting the Ghana goalkeeping debate to bed for the time being. Defences win you titles, and, despite a change of coaches, the Black Stars core still seems tighter than a Greek banker’s fist. In a match marred by abandonment after 75 minutes on the clock due to crowd trouble, the Elephants showed their experience and their quality in this 2-0 win. They may have overwhelming pressure in their quest for that elusive Cup of Nations, but out of the teams that have qualified they have the least question marks next to them. The only major question is that final hurdle. After the disappointment of a group stage exit in the last Cup of Nations, Angola have been threatening to become that team with the Tunisia-Paraguay Syndrome: the condition whereby you consecutively qualify for major tournaments but barely make any sort of impact. Going by their performance in their 2-0 win over Zimbabwe, however, Angola may finally buckle their swash in the upcoming Cup of Nations. Now coached by Uruguayan Gustavo Ferrin, who replaced Lito Vidigal in July, Palancas Negras exuded a style of football that wasn’t too far behind Morocco in the purist and quixotic stakes. It didn’t have the computer-quickness of the Moroccans but their brand new 4-3-3 system had ceaseless movement, the full-backs, Lunguinha and Miguel, free-wheeling forward with substance, Dominique Kivuvu manhandling the midfield, Djalma and Mateus dazzling the crowd with their pizzazz, and Manchester United hero Manucho adding the killer instinct. Tax on mobile phone usage in Niger may be about to come back. In January, the Government of Niger famously introduced a tax on mobile phone usage to help pay for the team’s participation in the Cup of Nations. The Nigerien Government cited that participation in the tournament would cost them £2.5m, and it simply couldn’t cope with the amount – not when it had other pressing matters to deal with, such as famine. It was only Niger’s first appearance in the tournament, and under the tutelage of gentle German Gernot Rohr, who led hosts Gabon to the quarter-finals in the last edition of the Cup of Nations, Niger managed to overcome Guinea with a 2-0 win at home on Sunday and make their second appearance in the competition. Gabon, who didn’t renew Rohr’s contract after the Cup of Nations (despite performing well and going out in the quarter-finals via penalties), failed to qualify after losing 2-0 to Togo in the second leg. It will be Togo’s first qualification since the 2010 Cup of Nations, which they pulled out of after their team bus was shot at on the way to the tournament. It’s good to have Nigeria and Algeria back – they’re two countries which have done a lot to put African football on the global map, and, more importantly, they’ve made it to South Africa on merit. Nigeria coach Steve Keshi’s formula of mixing domestic-based players and a smattering of in-form foreign-based players may just bring back the Nigerian mojo. They comprehensively demolished Liberia 6-1 to book their place in South Africa. Meanwhile, Algeria’s time in the wilderness seems to have done them an awful lot of good as they overcame Algeria 3-0 on aggregate with remarkable comfortableness to continue their renaissance. Goals and creativity came at a premium under previous regimes, as those who saw Algeria at the World Cup and the Cup of Nations in 2010 would attest, but in Islam ‘the Algerian Steven Fletcher’ Slimani, who plays the lone man so well, they have a diligent goal machine, whilst Sofiane Feghouli and Foued Kadir supply him wonderful service from either wing. Led by the peripatetic sexagenarian Bosnian Valid Halihodzic, the Fennec Foxes are a well-balanced outfit, have adequate reinforcements on the bench (Ryad Boudebouz and Rafik Djebbour have been languishing on the bench, for example), and will certainly be one of the dark horses in South Africa. At the start of Sunday, an underdog story to mend the hardest of hearts was that of Central African Republic (CAR). Ranked 49th in the FIFA rankings, CAR have been the highest risers in the rankings in the last five years (at their lowest point they were ranked 202nd), and qualifying for the Cup of Nations would have been a true zenith. Times have been rough and tough like leather for CAR – for much of the recent history they’ve not even had the money to play friendlies. They took a one-nil lead to Ouagadougou, and took an early lead which gave them the vital away goal. However, Burkina Faso flipped the game on its head and were leading 2-1 by half-time. Valiant defending in the second half meant CAR had started to see the shimmering red carpet to the continent’s showpiece. With 96 minutes on the clock, CAR, who giant-killed Egypt to reach this round, seemed nanoseconds away from adding another casualty onto their list. But there was a twist. Ball hopefully lofted into the box. Alan Traore header. Goal! Burkinabe jubilation. Football can be cruel. Sudan, the only East African representatives at the last Cup of Nations and the first East African side to reach the knockout stages since Uganda in 1978, were understandably the toast of East Africa after the previous edition of the Cup of Nations– well, their bête noire Ethiopia certainly didn’t partake in the toast. Poor old Ethiopia have had to watch their bitter neighbours get the plaudits as they’ve suffered years of longueur – 30 years absence from the Cup of Nations, in fact. Pot 4: Togo, Cape Verde, DR Congo, Ethiopia. The draw will be held on 24th October in Durban.